Designing a stylish kitchen on a budget takes some skill. After all, when it comes to planning a new kitchen, there is often a huge gulf between budget and expectation. An installation is made up of many smaller elements, aside from the units, that when you start adding on the price for labour, appliances, worktops, tiles and other extras, costs quickly escalate. To add to the confusion, ‘off the peg’ suppliers and bespoke manufacturers can offer similar-looking cabinets for wildly different prices (as much as £5,000 versus £50,000), which makes it difficult to know where to begin. So, we are on hand to help. We explain what you can expect to pay for various elements, how to get the best quality for a good price, and why you aren't restricted to buying from budget brands when planning a stylish kitchen on a budget. And, if after all that you still need more advice, you will find everything you need to know in our ultimate guide to planning and designing a kitchen. How much does it cost to design a stylish kitchen on a budget? As a very rough guide, it is sensible to spend a maximum of five per cent of the overall value of your house on a new kitchen to avoid losing money if you sell. When pricing up your furniture and worktops, be aware that estimates will vary quite widely depending on the quality and level of design you are after, but expect to pay f rom £17/m² for standard off-the-shelf units and work surface and up to £144/m² for bespoke units and design service. When designing a kitchen on a budget, it is wise to first factor in the cost of any known quantities to help you cut the cost of your new kitchen. These include appliances, decorative finishes and necessary electrical works to add extra sockets and lights, for example. Deduct these from your total budget before choosing how much to spend on the units and fitting. To design a kitchen on a budget, you could paint the kitchen cabinets yourself. You could also save over £1,000 by installing the kitchen yourself, but you will compromise the finish if your DIY skills are not up to scratch. Budget even lower? Check out our feature on designing a kitchen for under £5,000 (yes it is doable!). 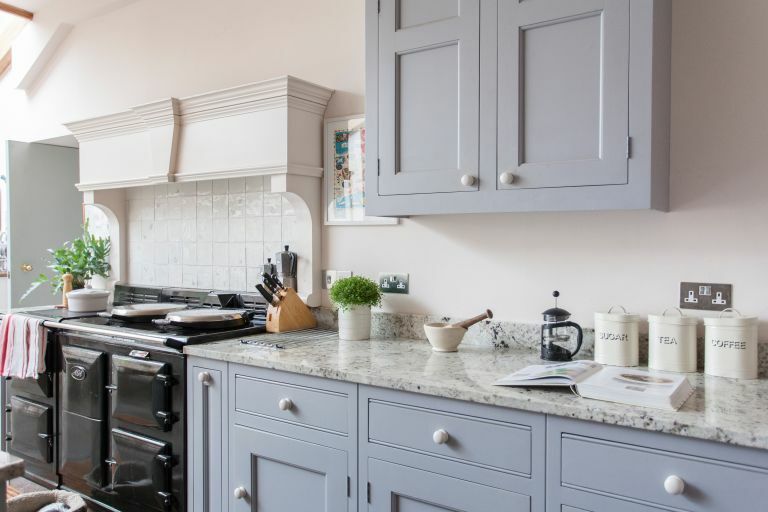 Bear in mind that fitting a cheap and cheerful kitchen can have a negative impact on a home's value, which makes your choice of cabinets and finishes so vital. You will have to invest carefully to get a beautiful finish on a limited budget. Use our guide to cutting the cost of a new kitchen for more clever ideas. Which kitchen cabinets should I buy on a budget? If you have a total budget of between £5,000 to £10,000, you may be surprised at the quality of cabinets you can afford. The majority of kitchens within this price bracket will consist of flat-pack carcasses with doors mounted on to the front using hinges screwed into the chipboard. The units are generally all the same on the inside – although some are made sturdier than others with an 18mm frame – with the look dictated by the style and colour of doors and decor panels. The cheapest way of getting a kitchen with a solid wood finish is to buy affordable off-the-shelf carcasses, such as from Ikea, and then get a joiner to make solid wood door fronts. You can even order them online – try Superfront, which makes doors, handles and legs for Ikea frames, or Shaker Doors Oxford. Use our kitchen cabinet design ideas for inspiration and advice. If you're designing a kitchen on a budget but want to achieve the look and feel of bespoke units, companies like Plykea and Husk, upscale Ikea Metod Kitchens with the help of bespoke and stylish plywood fronts and worktops. The beauty of this type of kitchen is that it can recreate the look of a more expensive in-frame design for less, which can then be dressed up with luxurious fixtures and finishes, such as a beautiful Belfast sink and bridge tap. Smart kitchen storage solutions, such as pull-out carousels, can also be installed into the units at a fairly low cost. It is possible to purchase a bespoke solid wood, traditionally jointed in-frame kitchen, where the doors sit within the frame, for about £5,000. Try Old Creamery Furniture and Pineland, which offer painted, solid wood freestanding units at a very reasonable price. As there are no units to put together, this reduces the time, and cost, it takes to install too. Also look at British Standard by Plain English. Plain English sells bespoke kitchens with an average price of £50,000 to £60,000 but, through British Standard, offer a more affordable range of quality cabinets – from £5,000 for a complete set-up. These have solid wood doors and carcasses made from white melamine faced European birch ply, with beech shelf lippings and traditionally dovetailed drawers. For more advice on how to design a free-standing kitchen check out our guide. Yep you read that right, the Dakota ready to fix kitchen from Wickes starts from just £457. It's a simple design that means you can really tailor the look with your choice of worktops and handles. All of the fitted kitchens available at B&Q come in at a really reasonable price, the Westleigh oak effect Shaker kitchen starts from just £879! You could always use the money you have saved on kitchen cabinets to invest in a high-quality work top, or splash out on your ironmongery to give the kitchen a more high-end finish. An ex-display kitchen can be an absolute bargain – and in top notch condition. The used kitchens on sites like The Used Kitchen Company and The Kitchen Exchange are fully inspected to check that they are in great condition so your second-hand kitchen won’t come with second-hand scratches, scuff marks or moisture rings. Plus, if you are buying an ex-display kitchen, it has essentially never been used. Everything is pretty much already assembled and ready to go with a recycled kitchen, so no time is spent matching fittings and fixtures. Providing you have the right measurements, your new kitchen can just slide into place; you could of course also hire a kitchen fitter just to make sure everything is exactly as you want it. The best types of kitchen worktops can make or break the look of a budget kitchen. When it comes to finishes, premium worktops will lift the look of the whole kitchen. Granite and quartz surfaces are a real investment, at several hundred pounds per 3m run, but durable composites, which replicate their intrinsic character and sparkle, are much more cost-effective. Solid oak work surfaces can be ordered online for as little as £100 to £120 per 3m run; try Worktop Express. If opting for a high-quality laminate, choose a good depth with a squared edge, and overhang it slightly at the end of unit runs for an elegant finish. If you're only replacing worktops but keeping the rest of the kitchen, you could try Granite Transformations, a company that fits a new worktop over the top of the old ones. Mix and match worktop materials, for example a granite island against timber topped units, for a bespoke finish. This also allows you to use a cheaper and more durable material where you do most of your work and prep, then inject a bit of luxury with a breakfast bar or plinth in something more high-end such as quartz. If you want any more advice on choosing the best types of kitchen worktops make sure you have a read of our guide. For a really cost effective solution, choose from Wickes' range of laminate and wooden worktops – the simple, matt black worktop is only £44 for 2m. Stainless steel is low-maintenance and tends to be the cheapest option – here's how to clean stainless steel. Composite sinks can withstand high temperatures and come in a variety of finishes. They can be pricey, but are a good investment as they are hardwearing. Ceramic sinks tend to come in styles most suited to period homes. However, they are prone to staining and chipping, but still a good choice if properly cared for. For more tips on choosing a kitchen sink, check out our dedicated feature. Ideally, you might pick out beautiful kitchen floor tiles, but if these are beyond your budget, it's really worth investigating the latest laminate flooring and vinyl flooring designs. Didn't think you had the budget for kitchen floor tiles? Just check out the huge range from Topps Tiles: their tiles start from just £9.99/m². If you are after an on-trend patterned tile, you may be looking at paying a bit more, but their gorgeous Westminster patterned tile is still pretty budget friendly. Kitchen splashbacks needn't be expensive but, since they cover a large area of wall, will make a big impact. Beautiful tiles are an obvious way to lift the look of a budget kitchen – and needn't be expensive. Use hand-finished tiles sparingly to give an artisan look to the space. You can then use less-expensive tiles for greater expanses. Try mixing in plain tiles in two or three different tones, such as grey or sage with cream, for a characterful country look. Stainless steel or glass splashbacks are easy to clean and add interest to a tiled wall. Kitchen suppliers have a number available, but consider looking online too. Some companies provide made-to-measure splashbacks at a fraction of the cost you would expect. Use our guide to choose the best kitchen tiles for walls and floors. Check out these splashback ideas for more inspiration and remember you can always save money by tiling a splashback yourself – just check out our guide to find out how. Do not neglect smaller details: ironmongery makes an enormous difference to the overall look and feel of a kitchen. Invest in characterful cup handles for drawers, and mix with elegant nickel knobs on doors. Alternatively, turned wood knobs are a more affordable option that look perfect in traditional Shaker-style kitchens. Kitchen window treatments needn't be costly to be good looking. Roller blinds are a cost-effective choice that allow you to add colour, texture and pattern to your room and make lots of sense, particularly in a small kitchen, since they take up so little space. Window film is another affordable option that takes up no space while allowing light to flood in. Shutters needn't be out of your price range – choose DIY design and fit options that cost a fraction of those that a designer measures up for and an installer fits. Antique shops or even charity shops are a great place to find old Welsh dressers and other freestanding furniture. These can be refreshed with a lick of paint or varnish. Look out, too, for butcher's blocks, which can make great freestanding islands. If you are planning on up-cycling your finds with paint, check out our step-by-step guide to painting furniture. Look in on our pick of the best furniture paints too. Plan the order of works well so that you don’t have to redo or undo work. Wiring and plumbing issues need resolving before you start installing cabinets, flooring and wall finishes. Salvage as much as you can from the existing kitchen. Sometimes the carcasses of your cabinets might be fine, but just need new doors. Take on DIY tasks that you feel confident with, but leave anything that involves the cutting or adjustment of expensive materials to a professional. Ahead of your project, keep an eye out for deals on big-ticket items such as worktops and appliances.